Industrial process heaters are heat exchangers used in a variety of industries, including the chemical and asphalt industries. These heat exchangers function as a part of larger industrial heating systems including components like thermal fluid heaters, waste heat economizers, and steam generators. Electric process heaters utilize helical and serpentine coils and have the capability to efficiently heat both liquids and gases. They come standard or can be custom designed to meet the unique needs of your facility. 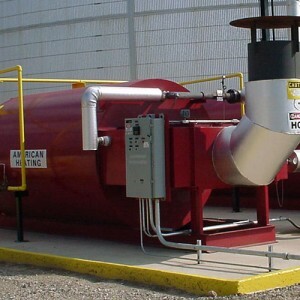 At American Heating Company, our industrial heating experts have extensive knowledge related to heat transfer, making us uniquely qualified to design custom industrial heating solutions for your plant or facility. We have substantial experience designing custom industrial heating systems for customers who were unable to find another heating system manufacturer that could satisfactorily meet the design criteria specified. A full line of asphalt heaters designed specifically for roofing plants and storage terminals. These industrial heaters allow for long run times and low film temperatures. Thermal cracking heaters with outlet temperatures to 750ºF. These innovative heaters are now being used to heat used motor oil so that the product can be refined to new clean No.2 fuel oil. With our heaters, our customers are enjoying high efficiencies as well as low maintenance costs. Interested in learning more about how our innovative process heaters and high quality industrial heating equipment can make your facility more efficient and cost-effective? Contact us today! We’re a reliable one-stop-shop resource for top of the line, American-made industrial heating systems that are built to last. Give us a call at (973) 777-0100 or fill out our quick and easy request a quote form online to get started today! 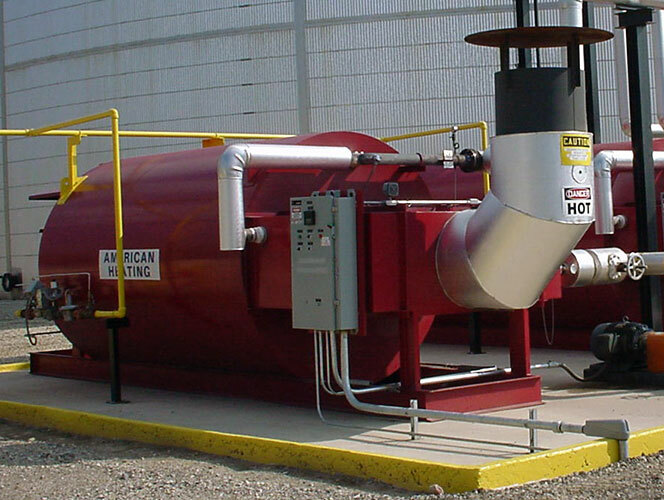 Key Features of AHC Industrial Process Heaters – Learn about some of the key features that set American Heating Company industrial heating equipment apart. Mechanical Reasons to Choose a Serpentine Coil Heater – Learn about the benefits of serpentine coil technology and why serpentine coil heaters outperform the more traditional helical coils in various applications. How Process Heating Equipment from AHC Can Save Your Facility Money – Get the details about the key features of our high efficiency heaters that help to save your plant’s resources.